As you may know I’m still making videos for the Ogham, and sometimes I also make a video how you can work magically with a specific tree or plant. This week I worked with the Elder tree, there is much lore and legend around this tree, and if you want more information you can head over to the Ogham, or you can watch my video of this tree. Often the elder tree is associated with darker entities, and it is also said that it has a deep connection with witches. For me personally, like the Hawthorn, it is definitely a Faery tree. You can use it in your workings with Faery and it can help you to deepen your connection with nature spirits. So here I would like to share with you, how you can use this tree to connect with the Fae. For myself during the lighter half of the year, it is no problem to feel close to the faeries, as I spend much of my time outside, I work in my garden and it is very easy to connect and to enjoy nature. Now in the darker half of the year, it is a bit different. I still work with the faeries, but I feel as if I wouldn't be as close to them. I spend most of the time inside, and I just go out for a walk, mostly in cold, rainy weather, frankly I don't enjoy it too much. That’s why I ask myself every year how can I bring the faery energy into my house, and as I work the rest of the year in my garden and gather herbs and plants (a very fae thing to do), I just need to mix them together and create an incense mix. Before I tell you more, I really want you to know how important it is, to be always respectful towards the trees and plants; ask their permission to use them, and you can even explain to them what you need them for. This respect is the most important step you have to take in order to work with Faery, but I’m very confident that, if you read this blog you are well aware of this. It is also a good idea to leave an offering if you take something, this can be milk, honey, a song, or even moon water for example. Now, let me share my own personal mix, that helps me to connect with the faeries. I use it whenever I sit down at my altar and want to work with them. As I said already, this is my own personal mix, and you can add something or leave something if you think that it is unnecessary, experiment with the berries, flowers and leaves for yourself. Let me explain shortly why I choose these plants for my incense mix. The Elder flowers have a strong connection to the faeries, and it is said if you use elderflower water and anoint your eye lids with it, you can see faeries. Let the flowers soak into the water and charge it under the full moon. Also when you make whistles out of the wood from an elder tree, you can use it to call the faeries. You can also burn the flowers in the Midsummer’s eve bonfire in order to see faeries. As you see, for magical faery work the elder flower is perfect. Blackberry is a very grounding and also a very protective plant. You can use the berries and the leaves for many magical purposes, like binding, banishing and money spells, but the reason why I chose this plant for my incense mix is because it also has a connection to the fae, and is still able to help me to ground and center. It helps to see how everything is interconnected and it protects against evil energies. 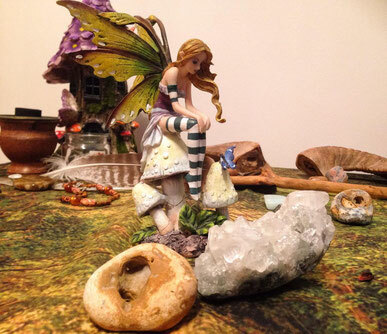 Even if I am not a huge fan to make faeries more evil than they are, I still think it is important to create boundaries as soon as you invite faeries into your home. You just have to find the middle path in Faery. They are not all fluffy and cute, but neither are they evil or malevolent, as certain folklore want to make us believe. Don't get me wrong, I really enjoy to use folklore as a research tool to learn more about the fae, but it is also important not to forget when all of this was written, often between 16th and 18th century, and at this time Christianity ruled in the Celtic Lands. Hawthorn is a well known faery tree, and to this day it is still considered bad luck if you cut down a solitary hawthorn tree, and people are scared of the faeries outrage. For this reason I would suggest to gather the leaves or berries, only from hawthorn hedges. In my own experience they are very cooperative. When you burn the dried berries as an incense it can encourage more vitality in your life, it can build up your courage, and yes you may need that in order to work with the faeries, and it brings more clarity and insight. I think this is a good addition to my mix. When you burn heather as an incense it brings you clarity and awareness and it also develops or strengthens you psychic abilities. Heather is also helpful to connect with your spirit guides. It is also said that it opens the portal to Faery. Heather is a very gentle and healing plant. Thyme has a very strong connection to faeries as well, and if you want to attract them to your garden you just have to plant thyme around your house. If you want to invite the faeries into your home you just need to sprinkle some thyme on your doorstep. It is also a purifier and energizer. I add rosemary in nearly every incense mix that I make, it is a strong protector, cleanser and purifier and it also increases magical and psychic powers. It attracts the faeries and keeps the evil spirits way. All right, now you have your ingredients for the incense mix, let’s move on. Prepare a sacred space, this can be your altar, or if you don't have one, just a place where you feel safe and comfortable. 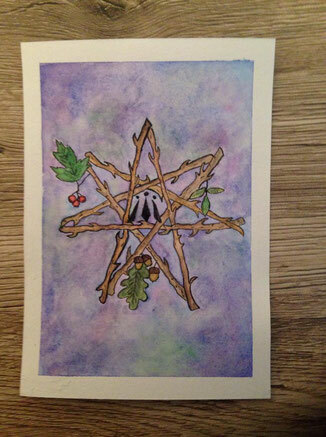 If you like you can get a piece of paper and a pen and draw the Faery Star, also called the Elven Star. Of course it doesn't have to be that detailed, I just enjoy doing these things. Try to do it yourself, rather than just to print it out. This seven pointed star is used to represent the seven elements or seven directions; air, fire, water, earth, upper world, underworld and spirit, or north, east, south, west above, below, and within. The star is your entry point to the Faery Realm. There are still different takes on the Faery Star, but I will write more about it at a later point. Leave a little offering for the faeries at your sacred space, again you can use milk, honey, cake, or even wine. If you like you can also lit some candles and maybe you even want to listen to music. When you are in a relaxed state of mind you can burn the incense and set the intention that you want to connect with the faeries. It doesn't matter if you leave your eyes open or closed, whatever feels good for you, is right. Call upon them, out loud or with your inner voice. Open your heart fully and greet the fae with joy and purity. You can also sing a chant to welcome them. Something I like to use, is a method by R.J. Stewart; he suggests to go at the crossroads in your mind’s eye. So imagine that you are at a crossroad, become aware of the four directions, north, east, south and west. The direction behind you, flows through you, and the direction in front of you, comes to you, the two other directions support you and keep you upright. Open your heart and your mind to everything, that may come your way, don’t judge what you may feel, see, or hear, but just give in to the experience. If you can’t feel any presence, don't stress yourself over it, that’s alright. Just keep doing it, it is very normal if you try this for the first time. It is possible that at some point you feel like dancing, or singing, then just do it, that could indicate a faery presence. They are very joyful and they want us to be free in our behavior, you don't have to sit straight so please feel free to move around if you have the urge to do so. When you feel that it is enough, thank the faeries, even if you couldn't feel their presence. Some people say never to say Thank you to the fae, I personally don't think that this is necessarily true, but mostly I say that I appreciate their help and leave them an offering. If you keep some kind of journal you can write down your experiences before you go back to your daily routine. Please know, that this is only one way to contact the Fae, I have various methods to connect with them, and I use the different ways according to what feels right at the time. Just try it out and see for yourself if this method works for you.